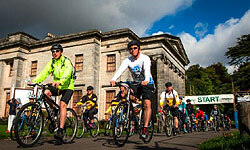 Three hundred people took part in the 2017 Dundee Cyclathon at Camperdown Park on Sunday 10th September. SPAR recently held the National Guild of SPAR Grocers annual golf tournament. Angus Towers- General Manager of Adam Purves Galashiels Ltd qualified at the SPAR Scotland Regional Golf Day held at Gleneagles in June and went on to win the finals of this event which were played at Hanbury Manor, just outside London. 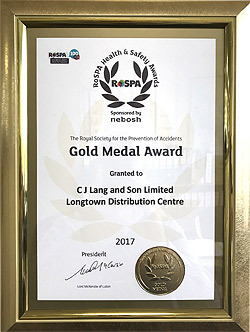 CJ Lang and Son Limited - Longtown Distribution Centre has won a Gold Medal award for achieving 7 consecutive Gold Awards in the prestigious RoSPA Occupational Health and Safety Awards. 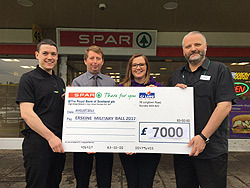 CJ Lang & Son Limited have joined the ranks alongside co-sponsors The Highland Club and Thomas Tunnock Ltd with a generous £7,000 donation to support The Erskine Military Ball - Erskine’s annual fundraising dinner which welcomes 500 guests and supporters to the glamorous, military-themed evening.